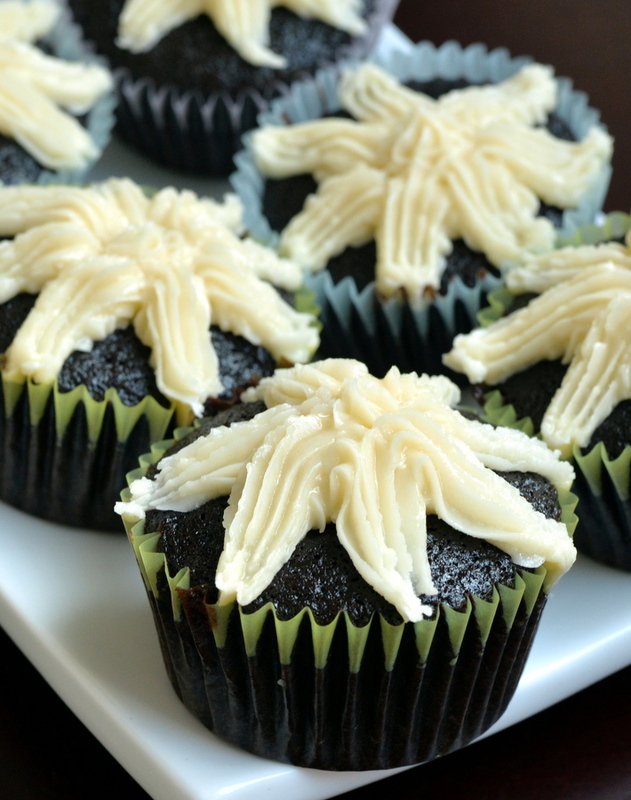 It is about something even better: The Best Vegan Chocolate Cupcake. I would not lie to you. These are wickedly awesome. These cupcakes have nothing sneaky hidden in them. No avocado, no chickpea flour or even mango. Previously, my go-to vegan chocolate cake recipe was this simple recipe and it continues to be a fool-proof, cheap and moist vegan chocolate cake that lends well to both cakes and cupcakes. While this cupcake recipe looks very similar, the small changes make a noticeable delicious, delicate crumb that makes you cherish excellent vegan baking. Chocolatey doesn’t do it justice. Moist and airy, nostalgically deep and dark and perfect in every way, you don’t need another chocolate cupcake recipe. A few noticeable differences from my previous recipe include the use of coffee/espresso and not simply the use of espresso powder. I asked Rob to brew me fresh hot espresso. The other difference is the use of egg replacer. I used Ener-G egg replacer. I can’t seem to find the source right now, but wherever I looked mentioned that the commercial egg replacers are better for baked goods that are more delicate. While not my first choice as an egg replacer in my day-to-day kitchen (this was the first time I bought it), the results of the cupcakes were phenomenal and totally worth the effort to seek out the egg replacer. My recipe differs slightly from Renee’s original recipe mostly due to user error. I made a calculation error while halving the recipe, and then tried to fix my mistake but botched it again. I ended up making a full recipe but modified the components of the liquid ingredients, with less coffee to compensate for an excess of the non-dairy milk. They turned out excellent so my modified recipe is included below. For those who don’t like the flavour of coffee, while I used a strong espresso, the coffee mostly accentuates the chocolate flavour. As a coffee-averse person, I did not find the coffee to be a problem. Of note, Renee mentions this recipe is NOT suitable for a sheet cake. It is too delicate to handle the heaviness of something bigger. In that case, I defer you to my original recipe. 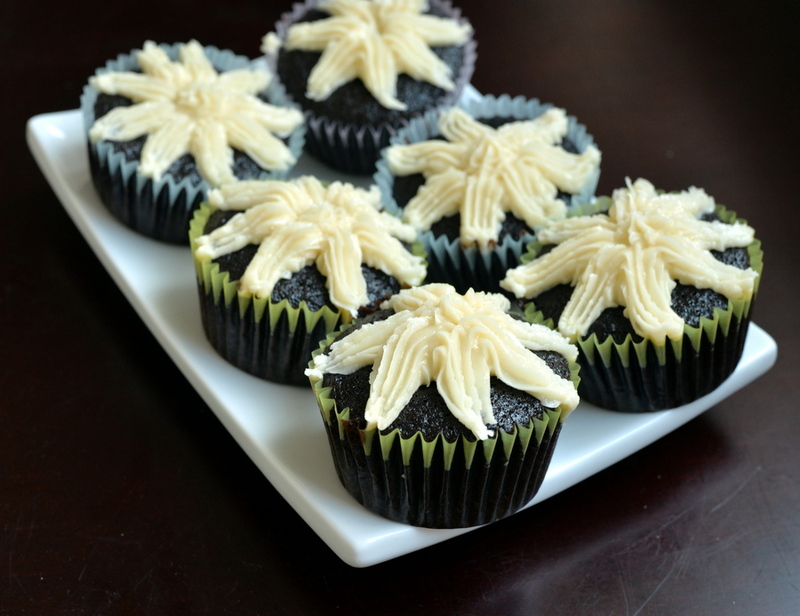 While we made these before Hallowe’en and my mom helped to frost these ones, a pretty spiderweb frosting could be easy to recreate. Emma has an easy recipe with a chocolate ganache and these are excellent directions. My search is over for a perfect chocolate cupcake, vegan or otherwise. Do you have a favourite recipe? PS. I am sharing this with We Should Cocoa (USA edition). 1. Preheat oven to 325 F. Prepare 2-3 muffin tins with liners. 2. In a large bowl, thoroughly whisk together the dry ingredients (flour, sugar, cocoa powder, baking soda, baking powder and salt). 3. In a smaller bowl, combine the wet ingredients (coffee, oil, non-dairy milk, apple cider vinegar, egg replacer and vanilla). 4. Pour the wet ingredients into the dry ingredients and mix until well combined. The batter will be relatively thin, but it should look dark and make ripples when you lift the spoon out of the batter. 5. Fill each liner with about 2/3 full. 6. Bake for about 30 minutes, until the cake bounces back at your light touch and a tooth pick comes out clean. Cool on baking racks for a few minutes, before carefully turning over and cooling completely. Frost once completely cool. 1. In a stand mixer with the whisk attachment, on medium speed, beat the non-dairy butter for several minutes. Add a few tbsp of the maple syrup and 1/2 cup icing sugar and continue to beat at medium speed until incorporated. Add the vanilla and 1/2 cup more icing sugar and continue to beat. Slowly add the icing sugar and additional maple syrup and non-dairy milk until you obtain an icing that tastes the way you like it and has the proper consistency. Pipe onto cooled cupcakes. I can barely bare to look at the brain cake so the idea of looking at brains a lot makes me admire you but I don’t want your job! The cupcakes look fantastic. I wonder if aqua faba would work as a substitute for the egg replacer? 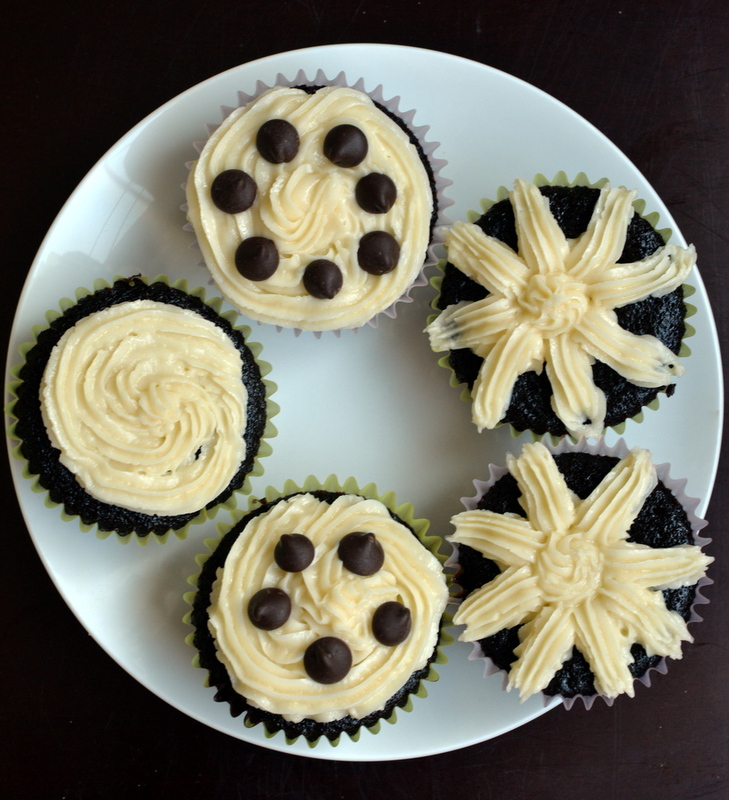 I must say these cakes look beautiful, dark and rich, and sound amazingly chocolate-y – the bit about brains doesn’t sound so nice so I’ll breeze over that part ;). 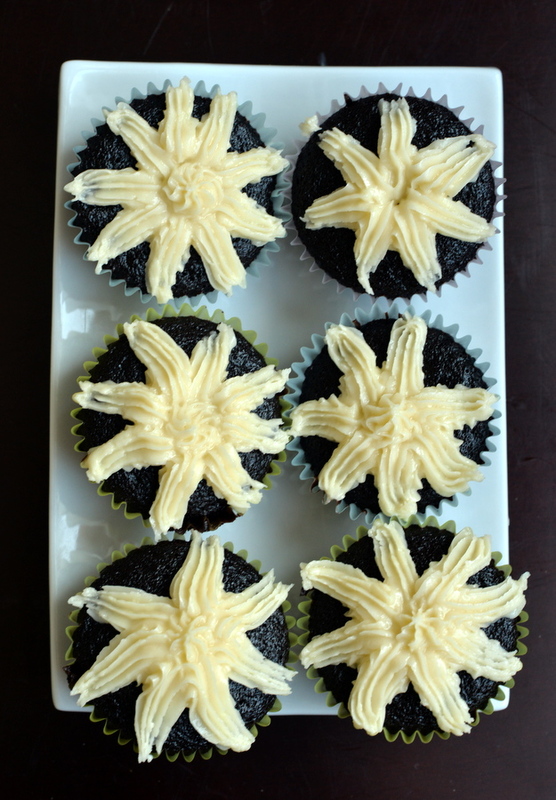 Thanks for sharing with #WeShouldCocoa – cupcakes are most definitely American! Ohhhh cupcake!! Yum! 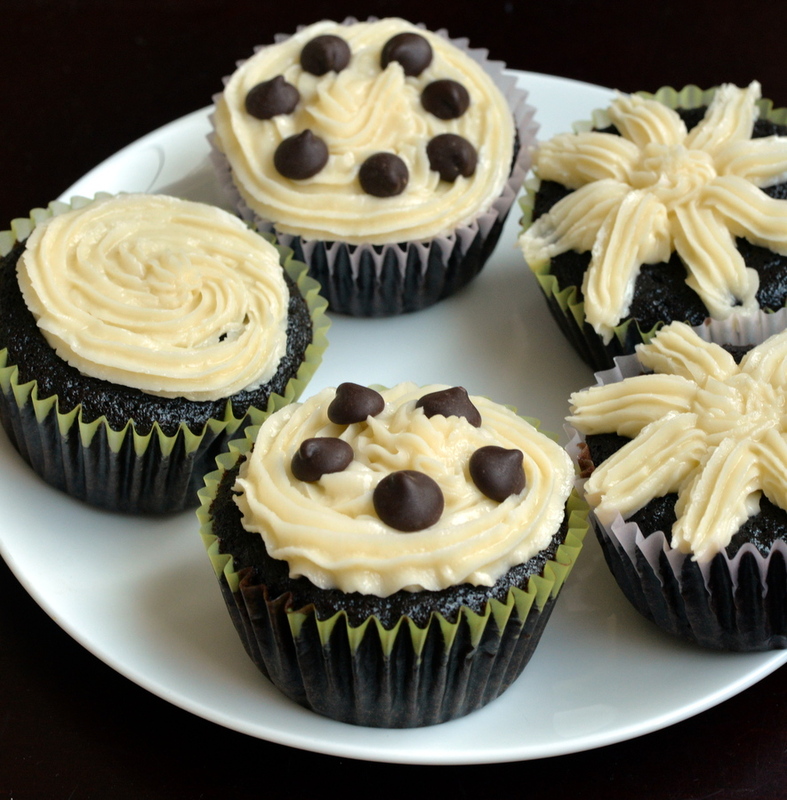 I especially love the sound of the maple buttercream frosting! I’ve just posted vegan chocolate pear muffins on our website. I love vegan baking, but I never use egg replacer, so I don’t know. Your cupcakes look really delicious!